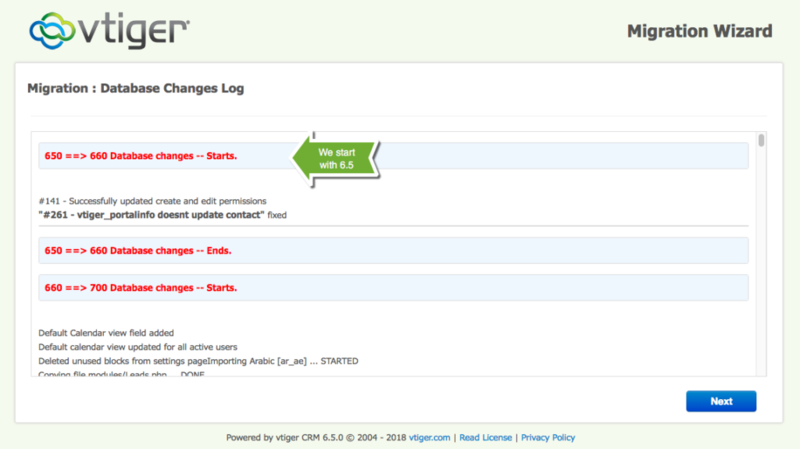 In this tutorial, I will show two ways to update Vtiger CRM. One is the usual way of downloading and uploading one patch for each version upgrade, the second way to do it, even if more complex one, will let you upgrade old versions (Up to 5.4) to vtiger 7.1 in just one step. Upgrading Vtiger is never an easy project. So be prepared to have to deal with some issues along the way. Not ready to do it yourself? Get in touch with us, VGS Global can handle this for you. Let’s start with the most critical step. Creating Backup of the CRM Files and Database. There are two ways of updating vtiger to a new version. The first way is to use the patch provided by Vtiger. This method is very similar to earlier versions. 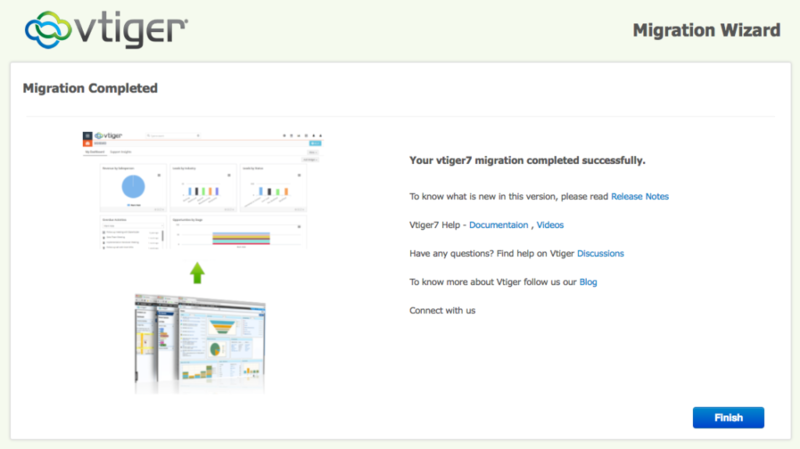 You will need to backup your files and database, download the patch, extract it, and run the VTiger 7 migration wizard. 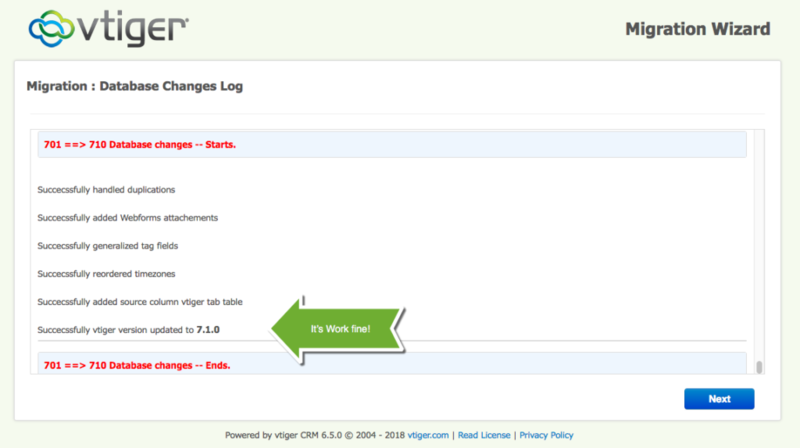 Unzip patch.zip into Vtiger CRM Folder. A file called vtiger7.zip and migrate folder will be unpacked. Follow the instructions provided on the wizard. If everything works as expected, you will see the confirmation screen. The second option is to start with a clean installation of vtiger 7.1, connect your database and run the migration scripts to make it up to date. This option, even if more complex, will let you upgrade from an older version (up to 5.4) directly to vtiger 7.1 Even something like 5.4 can be upgraded to vtiger 7.1 with this methodology. This method provides a significant increase instability and a big decrease in headaches. 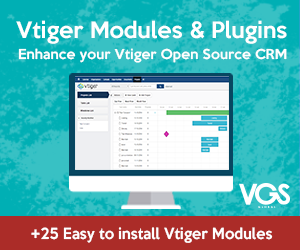 In your old Vtiger disable all the custom modules and log out, do NOT close the tab. Re-install the custom modules with the zip file provided by your vendor if you need to. If everything works fine, you should have a clean install of Vtiger 7.1, with all your data and custom modules on it. If you are a ‘do it yourself’ type of person and have enough knowledge about VTiger and its’ upgrade process – you should be able to do it yourself. On the other hand, if you consider your data too valuable to take the risk, we at VGS Global can do it for you.